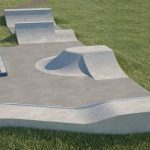 Matlock skatepark can be found in Hall Leys Park and is made up of wooden ramps on a tarmac base. It is set up in the standard council back and forth arrangement with the usual obstacles. At either end are two walls of quarter pipes and flat banks that face each other and in between the two is a funbox with a hubba joined at the side with a jump box. Next to these two is also a spine and running down the edges of the course are rails and ledges. 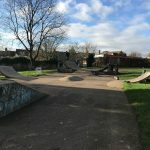 Matlock is a nice local park and the ramps were recently revamped, improving their condition and making their surfaces smoother. 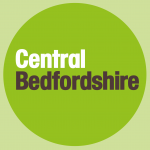 It is a good place to practise the basics but if you want a more challenging skate try one of the other parks in the area. Matlock train station: Exit Matlock station onto Snitterton Road and head east to cross over the main road and then follow Matlock Bridge over the river. At the roundabout turn right onto Causeway Lane and Matlock skatepark is in Hall Leys Park on your right. 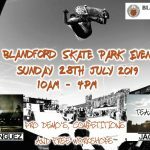 Causeway Lane bus stop: Exit the bus onto Causeway Lane and Matlock skatepark will be in the park. There are no on site toilets but there are free to use facilities nearby in the cafe.